As far as unlikely luxury outposts go, Sheldon Chalet just might take the cake. Resting on a granite nunatak within a jagged amphitheatre on the flanks of North America’s highest mountain, the chalet is a true marvel and an unparalleled experience. The seismically secured hexagonal structure—featuring large picture windows—is the realization of a dream held by three generations of the Sheldon family, and a portal into a world once only accessible to mountaineers. From the observation deck (or from the comfort of your bed) it is possible to catch the utterly ethereal dance of the aurora borealis. For those who want to immerse themselves in one of the world’s most pristine and remote mountain environments but still desire a warm hearth and some fine-food treatment at day’s end. 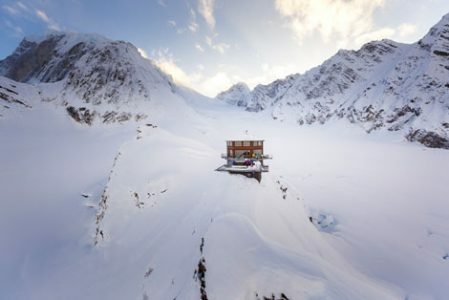 Absolute Must-Do Waking up to the incredible Alaskan panoramas, straight from the bed! It’s truly unlike anything you've ever seen before. The beauty of Sheldon Chalet is its pure remoteness. The feeling of being completely alone in the wild is incredible. You literally become part of the landscape. It’s a rare treat to find yourself beyond the easy access points to Mount Denali Park. Sheldon Lodge’s secluded setting is even rarer for its privately-owned existence, which means getting there is part of the adventure! From Anchorage a two-hour drive brings you to the lovely town of Talkeetna from which you’ll take an hour-long helicopter ride to Don Sheldon Amphitheater, the valley in which your cozy abode resides. Whether you’re interested in trekking to the original mountain hut—built by Don Sheldon in the 50’s for backcountry enthusiasts–or taking to the skies to fully understand the work of cartographers of the same time, you’ll find no shortage of activities to keep you busy. Though, it’s worth stating, sometimes contemplating un-wavering mountain views (in top-notch comfort) is gift enough. 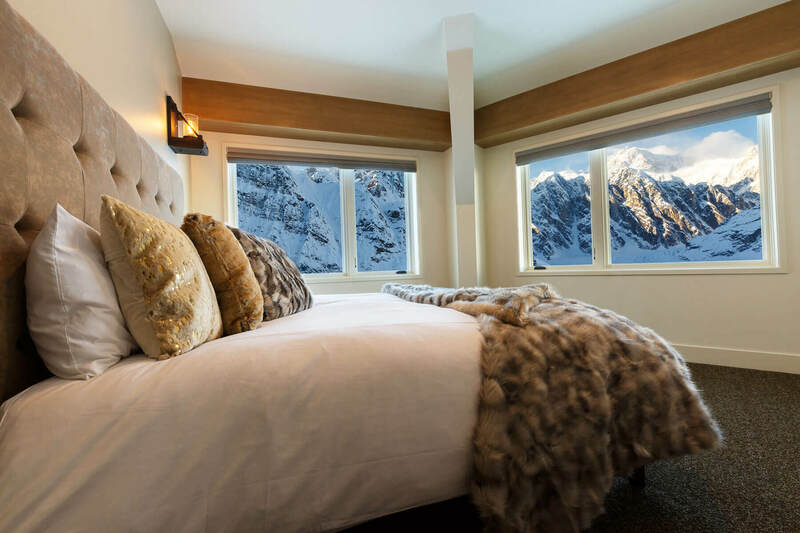 All five guest rooms are identical and offer unobstructed views of the towering Alaska range. Three fully functioning bathrooms are shared between the five rooms (a concession due to the challenges of constructing larger structures in such extreme environs).